Through three weeks of the NBA season, Washington sits with a record of two wins and seven losses. 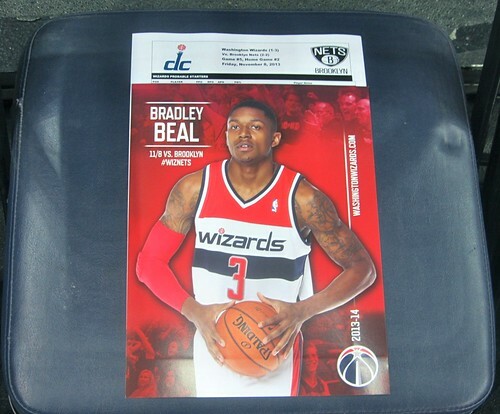 This is definitely not the start that all those around the Wizards had envisioned. Injuries are mounting, Nene is calling out teammates in the media, Wall is mired in a shooting slump, the bench stinks, and the team could not close out a winnable game on Saturday night versus Cleveland. #SoWizards is always kicking strong. I felt the need to provide a more positive note and showcase some of the videos I took from the Wizards overtime victory against the Brooklyn Nets on November 8. 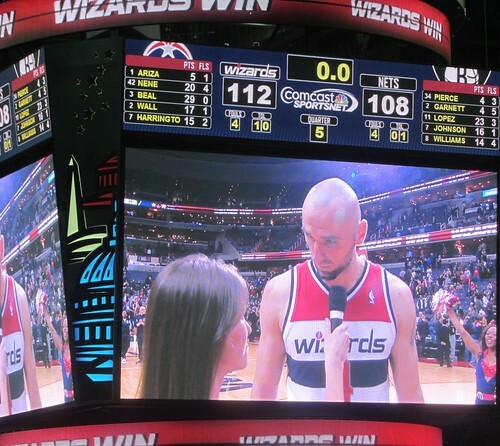 The game was played 11 days ago, but it marks the last time the Wizards won a game. 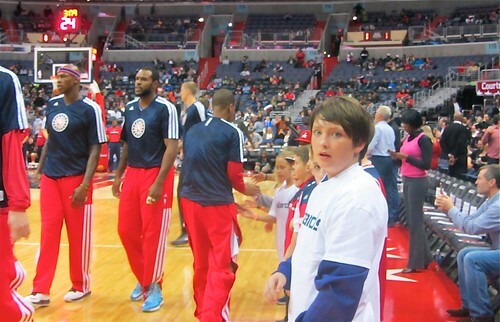 Maybe it could warm up Wizards Nation with some good vibes. Late in the fourth quarter, Brooklyn’s Brook Lopez ties the game up on a free throw, Trevor Ariza misses a 3-pointer and John Wall makes a big steal but his foot was out of bounds. Kevin Garnett gives the Nets a two-point lead by knocking down a clutch jumper. 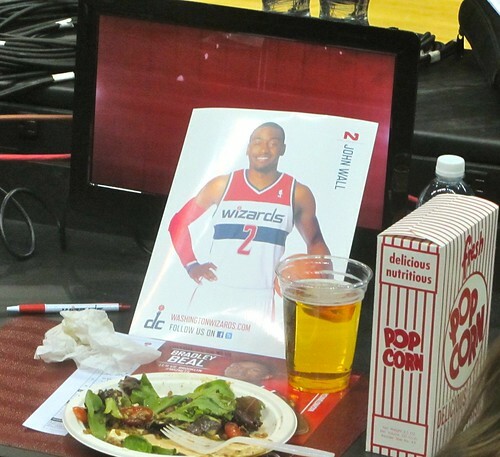 With the Wizards looking to tie the game up, Wall commits a bad turnover. All looks lost. 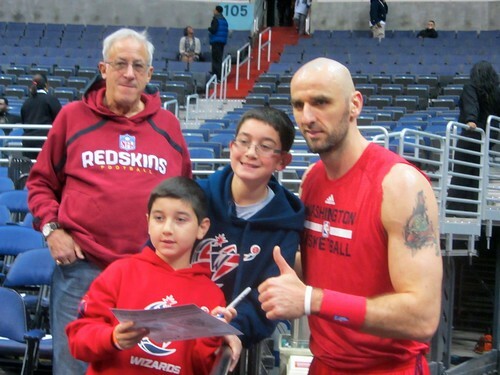 With Washington down by two, Garnett misses a dagger jumper and Marcin Gortat corrals the rebound. 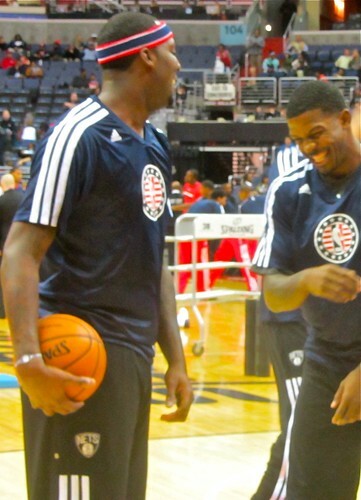 Instead of immediately calling a timeout, he passes it to Wall, who was looking to race down the court. 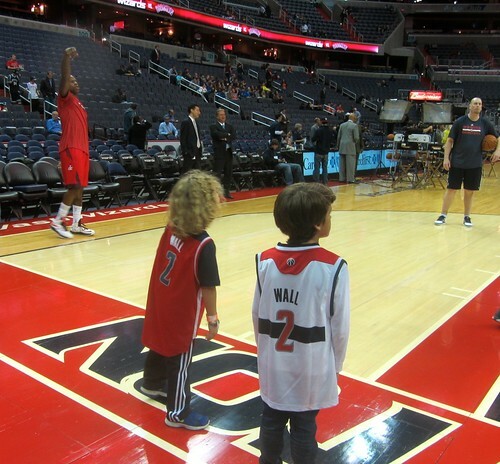 Some observers wondered if Wizards would have been better off with Wall trying to create a shot in transition. However, the replay shows that Nets already had four guys back on defense. Luckily, the refs granted Washington a timeout immediately, which allowed them to advance the ball to half court. Wall has his game-tying shot rejected out of bounds by Garnett. Nene tips in Wall’s miss with 1.2 seconds left to tie the game at 99. If this shot does not go down, the Wizards would be 1-7. Jason Terry’s game-winner attempt falls off the mark. 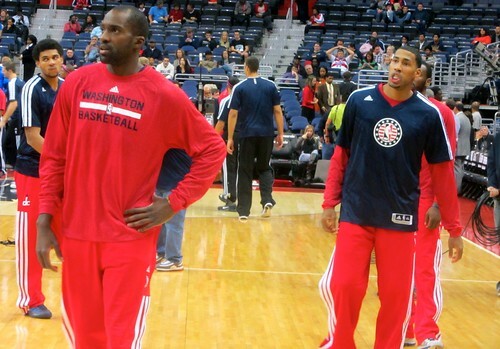 Nene is upset because Nets got away with a moving pick to free Terry. Washington owner Ted Leonsis gives Nene a high-five as he enters the huddle. Down one with under minute left, the Wizards moved the ball around nicely to free up Trevor Ariza for a huge 3-point bucket. Joe Johnson’s tying shot attempt comes up short. Washington makes clutch free throws and seals the victory. 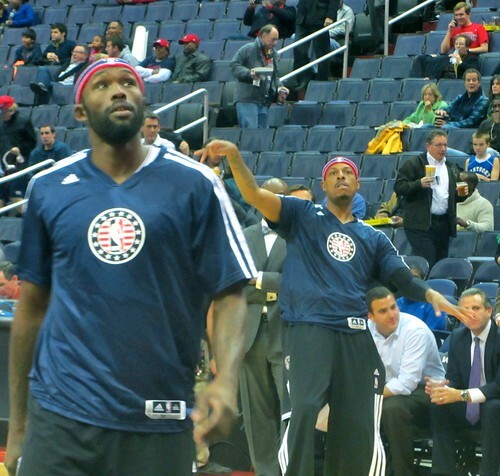 Before the game, I hung out in the visiting locker room for a chance to interview former Wizard Andray Blatche. To what will be a shock to many Wiz fans, Blatche was going over a scouting report with Nets assistant coach Roy Rogers on a laptop. Being around this group of Brooklyn Nets for first time is a weird experience. Seeing Kevin Garnett and Paul Pierce in something other than Celtics gear is also strange. The locker room is full of players you recognize immediately, which is not always the case with visiting teams. As I waited patiently for Blatche to conclude his study session, Reggie Evans was watching a movie on his iPad, Jason Terry was killing a game of Candy Crush on his iPhone, and Deron Williams was eating Reese’s Peanut Butter Cups. Having previously spent some time around Williams during the Team USA practices in the summer of 2012, I already had negative impression of him because of the way he treated people. He did little to change my perception via his interaction with game day staff trying to help him out. Williams ended up with six turnovers and 14 points on 5-for-14 shooting. After some minutes, Blatche was finally free. But after agreeing to chat, he said he had to make a phone call and left the locker room. The media’s allotted time was then up, and I had to leave without an interview. Score one for ‘Dray on the savvy veteran move. 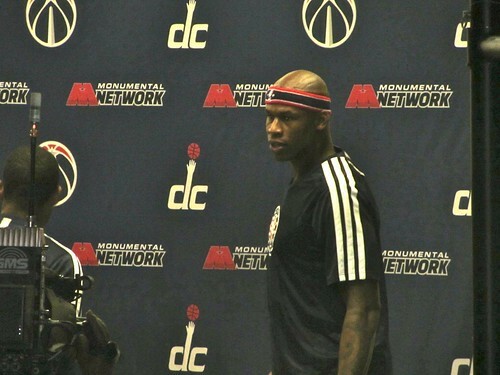 Now if Wall and the Wizards could only turn back the clock to their winning, and shooting, ways.